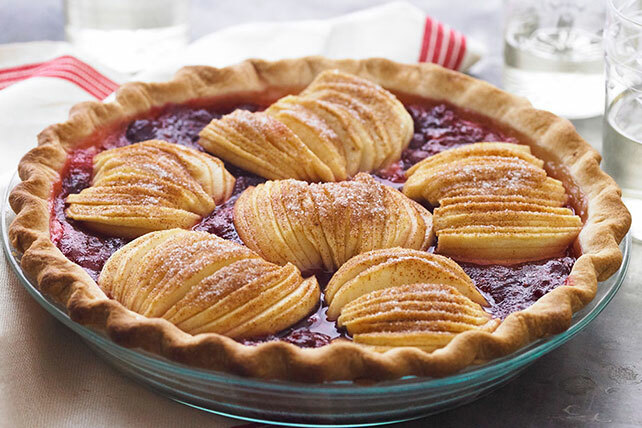 Adding the thin slices of cinnamon-sugar apples to this sweet and tart cranberry pie make it as lovely to look at as it is tasty to eat! Bring cranberries, water and 6 Tbsp. sugar to boil in small saucepan on medium-high heat; simmer on low heat 8 to 10 min. or until slightly thickened, stirring occasionally. Cool slightly. Heat oven to 425ºF. Place pie crust in 9-inch pie plate, pleating edge as necessary to fit. Beat cream cheese, egg, vanilla and 1/4 cup of the remaining sugar in medium bowl with mixer until blended; spread onto bottom of crust. Cover with cranberry sauce. Peel apples; cut in half. Remove and discard cores. Place apples, cut sides down, on cutting board; cut into thin slices, being careful to not cut all the way through apple to keep all slices for each apple half intact. Arrange over cranberry sauce. Combine cinnamon and remaining 2 Tbsp. sugar; sprinkle over apples. Bake 28 to 30 min. or until apples are tender and edge of crust is golden brown.